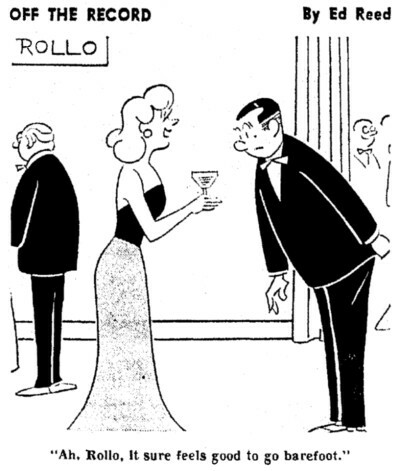 Our cartoon for this weekend is from Off the Record, which was drawn by Carl Kuhn from 1935-1940, and by Ed Reed from 1946-1984. This one ran on September 20, 1968. While women all-so-often wear high heels, sometimes they do have a remedy. Here is an interesting column written in 1932, when barefooting kids were starting to disappear in the United States, particularly in the cities. It is written by an educator named Angelo Patri. Slate recently had a feature on photographer Gabriele Galimberti, showing young children with their most prized possessions. I guess it says something about how much I’ve come to expect even children to be wearing shoes that I was pleasantly surprised that about half of them weren’t. When I was out in the yard yesterday, it was clear that some of our trees had been damaged. It wasn’t hard to figure out how. It seems there are a few folks who want to claim to be John Greenleaf Whittier’s “Barefoot Boy”. One of those was Hans Peter Bertelsen. Add to that Francis D. Marston.